Resident doctors play a pivotal role in supporting Canada’s healthcare system. In addition to our role as learners, we are also service providers and educators. 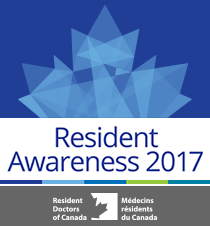 Resident Awareness events celebrate and bring attention to the unique and important contributions that Resident Doctors make to Canadians. To that end, Resident Doctors of Canada (RDoC) is launching several new communication products concerning Resident Awareness. The updated Ten Fast Facts about Resident Doctors in Canada infographic presents important information about us in a visually compelling way. It draws information from RDoC’s internal metrics as well as recent data from other national health organizations. New Resident Profiles. This series of first-person accounts was launched during the 2016 Resident Awareness event. The profiles help learners with the career decision-making process by offering true-to-life descriptions of what it is really like to be a resident training in various specialties. We will be releasing a number of new Resident Profiles in 2017. Also, be sure to pay attention to the activities of your respective Provincial Housestaff Organizations. Many of them will be holding Awareness activities of their own, which RDoC will be promoting via social media – keep an eye out! You can visit RDoC’s Our Provincial Partners page for information about each of these organizations. RDoC represents over 9,000 resident doctors across Canada. Established in 1972, we are a not-for-profit organization providing a unified, national voice for our membership. RDoC collaborates with other national health organizations to foster excellence in resident physician training, physician wellness, and patient care. On behalf of the RDoC Board of Directors, I hope the work we are doing to promote Resident Awareness in 2017 will make you proud as resident physicians!